Presonus FaderPort 8 : Although a keyboard and mouse are tried-and-true DAW-control devices, they’re far more effective when used in tandem with the FaderPort™ 8’s precise tactile control over mix and automation functions. With 8 touch-sensitive, motorised, 100 mm faders and 57 buttons covering 78 different functions, you can quickly zoom in on audio files for editing, adjust your click-track tempo with a simple tap, modify plug-in parameters, manage aux mixes—and, of course, control track levels with the touch of a finger. With the FaderPort 8, you’ll enjoy the fastest, most efficient workflow you’ve ever experienced. Rather than forcing you to revise your mixing method, the FaderPort 8 augments the way you currently mix. You still use your faithful keyboard and mouse for things they do well, and the FaderPort 8 handles the features you want to get your fingers on, allowing you to customise your workflow. Large, illuminated buttons make finding the function you need quick and easy. Eight high-definition digital scribble strips provide visual feedback. And if you select a track with your mouse, the FaderPort 8 will follow your selection, giving you yet another way to get to the function you need, right when you need it. This is DAW control the way you always hoped it could be! An amazingly fast, efficient studio workflow awaits you! With the compact, easy-to-use FaderPort 8, you’ll enjoy the fastest, most efficient workflow you’ve ever experienced. 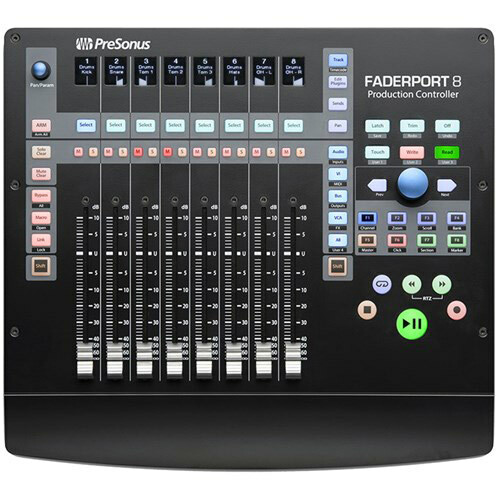 But don’t just take our word for it; visit your favourite PreSonus dealer and try the FaderPort 8 for yourself!